This cheerful chiffon and lace dress has a boho-chic touch. The Bright Days Chiffon and Lace Dress is fully lined except at the waistband, which is semi-sheer. It has a strapless sweetheart neckline and lightly padded bust. The bust is made of ivory lace with a unique circle pattern. The empire waistband is made of semi-sheer floral lace. The attached skirt, made of chiffon, has a flowy A-line cut. A hidden back zipper completes this dress. The Bright Days Chiffon and Lace Dress would look nice dressed up with pumps or wedges—or wear it more casually with flat sandals and an oversized bag. This is a great wardrobe staple you’ll love to wear. Details: Made in USA. Fully lined. Semi-sheer waistband. Lightly padded bust. Hidden back zipper. Shell 1: 100% polyester. Shell 2: 60% nylon, 34% cotton, 6% spandex. Lining: 100% polyester. Hand wash cold or dry clean. Small measurements: Length from top of bust to hemline: 30”. Bust: 30-32”. 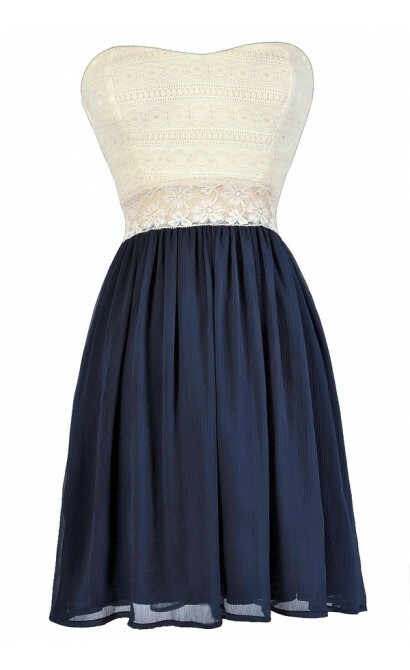 You have added Bright Days Chiffon and Lace Dress in Light Navy into Wishlist. 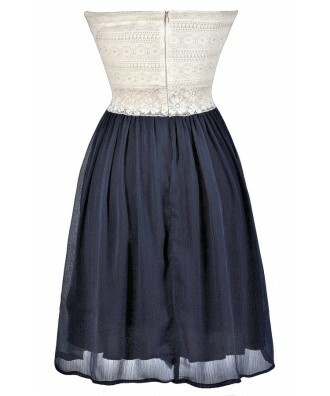 You have added Bright Days Chiffon and Lace Dress in Light Navy for Stock Notification. 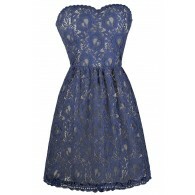 You have set Bright Days Chiffon and Lace Dress in Light Navy as a loved product. 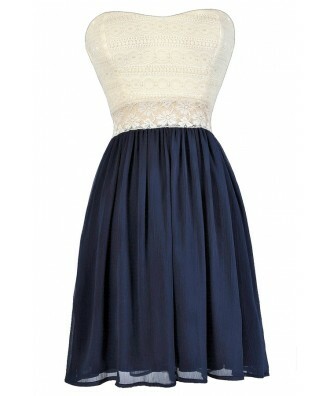 You have removed Bright Days Chiffon and Lace Dress in Light Navy as a loved product.